The GORE-TEX membrane maintains a dry environment for the foot by completely shielding the shoe from water. Breathable mesh and synthetic overlays add more security and comfort. The OrthoLite Sock Liner offers additional underfoot comfort and a healthy interior environment for the feet, according to a handful of runners. Responsive cushioning and motion control are provided by the FORMOTION mid-sole material. The adiPRENE+ gives additional comfort to the forefoot area while also allowing a better forward motion. Continental rubber and the TRAXION outsole tech bring the Terrex Fast R GTX durable protection and traction over many types of terrain based on several reviews. There were testers who felt that the heel area was a bit tight and uncomfortable to the skin. The Fast R GTX has an expensive price. The Adidas Terrex Fast R GTX is a robust trail running shoe for anyone who needs support, durability and waterproof protection. It is reliable over any type of outdoor terrain and sturdy enough to function extremely well. Given all the positive praised, the Terrex Fast R GTX is indeed a worthy investment. It really is an all-terrain vehicle. On local hikes in the Boise Foothills in all kinds of conditions—dry, packed dirt, mud, wet snow, and rain-drenched rock—the outsoles bit without a slip. The Fast R stands out for being both nimble and rugged; it's not a compromise, but an elevation above and beyond what exists in the category. We charged hard in the Fast R on long speed hikes in the Presidential Range of New Hampshire's White Mountains -- in the sun and in pouring rain -- and found it to be an exceptional companion. The only drawback I can detect with this shoe is the lacing system. This may be personal preference, but cinch up, drawstring style laces have never done it for me. Great for snowboard boots, lousy for hiking shoes. 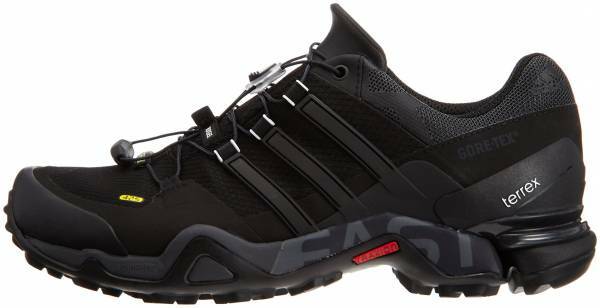 The Adidas Terrex Fast R GTX are light athletic shoes which are - due to their protective weldings and a grippy Continental™ Rubber outsole - also suitable to wear on the mountain. Adidas’ rugged and versatile Terrex Fast R GTX just got better in this new version. Runners will have a faster and more convenient time with the new speed laces that are made of very tough material. A quick toggle of the laces and runners get their best and most personalized fit. For better ground feel and to make it nimbler than the prior version, Adidas lowered the profile of the running shoe. With a lower stack height, the 8mm heel drop will be maximized for smoother and quicker transitions while stability increases as the foot is not as elevated as before. The outsole gets a boost with super aggressive lugs with generous spacing. Running downhill or uphill will be a cinch due to the extremely sticky rubber compound from the German tire maker, Continental as well as Adidas’ own Traxion. The specifically-designed spacing of the lugs enables the shoe to shake off mud and keep it from weighing more when any muddy trail comes along the way. The fit and sizing of the Terrex Fast R GTX are reminiscent of the original model that was introduced in 2012. It has an average room in the heel with a really snug midfoot. The toe box has ample volume and width that makes the shoe ideal for mid to long distance runs. Medium is the available width of this shoe. Sizes are from 7 to 14 for the men’s and 5 to 11 for the women’s. Adidas continues to work with giant tire manufacturer, the Continental, in producing rubber outsoles that are based on the compound used in bicycles that deliver superior grip and durability. This is the same compound used in the Fast R GTX that has 30% more bite on wet or dry surfaces. Adidas’s own Traxion compound is used in the outsole for a truly outstanding traction on the trail. The Formotion technology is also at work in the outsole as evidenced by a decoupled heel that helps with shock absorption. Adidas’ signature AdiPrene+, which very light and durable, mans the forefoot for really responsive cushioning and enhanced toe off. The Formotion midsole helps with the cushioning and makes the transitions smoother. The upper is made of breathable and abrasion-resistant mesh that adapts well to the runner’s foot. Giving support to the upper are overlays running from the midfoot to the area between the forefoot and midfoot. The new speed laces are directly connected to the overlays, which really enhance the locked in security of the Fast R GTX. And similar to the Adidas Pure Boost, the shoe uses molded Ortholite Sockliner which makes step-in comfort plush while the EVA-made and molded tongue elevates the sock-like feel of the upper. The Gore-Tex membrane below the mesh offers waterproof protection without sacrificing ventilation.